Former Chicago Tribune photojournalist and Pulitzer Prize winner Alex Garcia delivered masterfully conceptualized images of Chicago customized for the STA website and brand. Director of Digital Services, Randal Birkey commented, “Although STA is Chicago-based, it has a national and global reach. We wanted to capture our Chicago atmosphere and business culture with these custom images and communicate those qualities to our audience.” STA Group’s own STA Digital practice area carried out the task of building and optimizing the new site which created an easy transfer of the company’s mission to the creative and technical teams. – Tom Cumbo, Senior Managing Director, STA Group, LLC. STA Group seems to have found their niche in providing thought leadership on topics such as IoT, Big Data, Mobile, Cloud, Architecture and Digital Strategy. STA has already had a very exciting year and the new website is adding to the momentum. – David Dillon, Senior Managing Director, STA Group, LLC. 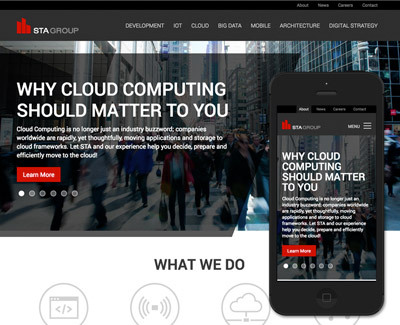 STA Group is passionate about technology and delivering world class results for their clients. STA’s clients have rewarded them with a compounded growth rate since inception of over 30%. STA Group provides a wide range of technology services including software development, state of the art tools and techniques, and expert consulting for organizations who want results. STA has over 160 consultants working across their four main practice areas which are Technology Services, Architecture, Internet of Things and Digital Services. STA has a wide range of skills and certifications including Big Data (Hadoop etc. ), Security (CISSP), Java, Architecture (TOGAF), Business Architecture, Microsoft, testing and many others.